Pintle chain is one of the oldest chain styles that is still in production and in-use today. It's high-strengths and inexpensiveness makes it the chain of choice for many applications all around the world. 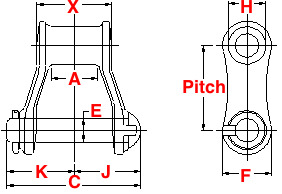 Because most pintle chains offer such and extended service life it is easy for part numbers to be made unreadable, or depending on the manufacture the part number may not be put on the chain to begin with. 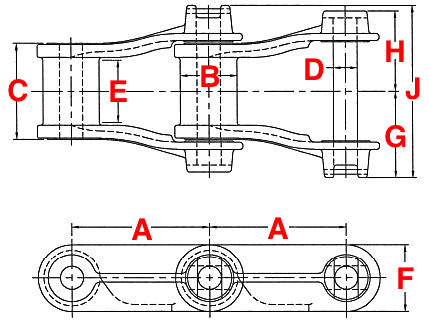 Below we will show you how to identify pintle chains based on their class/ series. To identify the chain simply check the dimensional information then line up each dimension with the size on the chart. 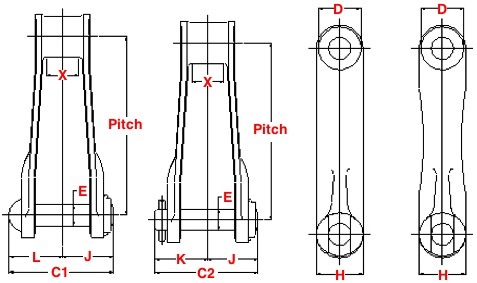 Note if none of the below pintle chains match-up to the size you have please contact us and we will be happy to assist you. 1.634" 11,700 LBS 0.44" 0.94"
To get a quote on pintle chain fill out the request for quote form and someone from our customer service team will contact you.